In our last but one blog, I reported on two Tawny Owls and a Sparrowhawk that came in to our hospital. One of the Tawnies was a juvenile that had been involved in an RTA, but since there were no obvious injuries, it seemed most likely that it had been buffeted by the slipstream of a vehicle rather than actually colliding with one. The other Tawny was found in a kitchen, having fallen down the chimney. They have since been given plenty of TLC by our falconry team and spent a couple of weeks in our specially designed rehab aviaries. At the time of writing, both Tawnies have just been taken to be released back into the wild, which is really excellent news! The other patient to come to us at around the same time was a male Sparrowhawk. The Sparrowhawk was found in a garden in Stonham Aspal, literally just down the road from the Sanctuary. Close examination revealed some superficial damage to one wing and that the skin underneath the feathers was clearly inflamed and bruised. The most likely scenario was that the Sparrowhawk had collided with some kind of obstacle hence the bruising. Time to recover from the trauma is often what’s most needed in such cases and in this instance the bird was also treated with Metacalm to help reduce the inflammation. 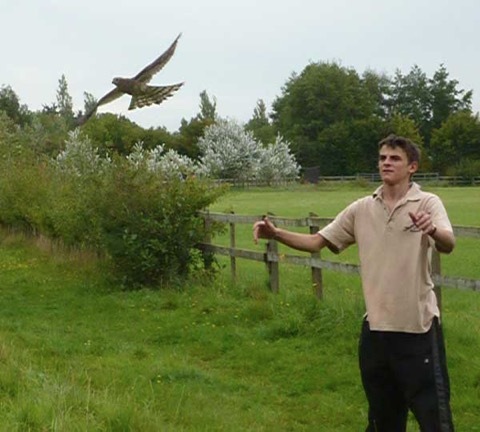 After the Sparrowhawk had spent a couple of weeks in a quiet, secluded rehab aviary, Andy went with one of our volunteers, Doug, to release it in Stonham Aspal, close to where it was found. Although obviously it’s a great feeling to be able to write about the hospital’s rehabilitation successes, it’s important to be realistic and accept that sometimes nature has other ideas. We recently had two juvenile Kestrels brought in to the Sanctuary both of which were very thin and malnourished. Despite the falconers’ best efforts, the youngsters were too far-gone to recover. In the natural world, it’s a harsh fact that at least 50% of raptors will die due to starvation in the first couple of months of leaving the nest. Unfortunately it really is a question of natural selection and nature’s way of ensuring the survival of the fittest.